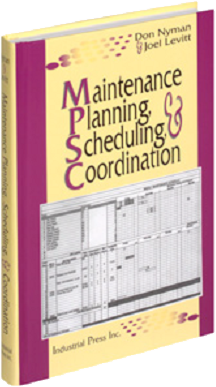 Maintenance planners, planners in training, supervisors and people who have to manage the planning function. In addition schedulers, material coordinators and maintenance engineers that get involved in creating job plans. There is also an advantage to having representatives from operations and stores for their perspective and input. Our promise for this program is that your planners will be conversant with the techniques and procedures of effective planning and scheduling. They will also be trained to coordinate the maintenance schedule with production control and operations. This new understanding will lead to better job plans and more effective scheduling. A few extras like reduce parts usage and higher organizational morale (in production departments) are also direct benefits of planning and scheduling. 1. 100% of the course will pertain to your industry and your maintenance situation. 2. Can be adapted to your maintenance language and forms to be easily usable. 3. Special issues can be discussed on a confidential basis with the instructor. 4. Schedule to be convenient to your business cycle. 5. Use as a team building experience. 6. Create a shared a common language and vision for maintenance. What is planning and why plan maintenance jobs? How to Sell Planning & Scheduling to your management and operations? Specifically where does the ROI (Return on Investment) come from with planning? Understanding the Nature of Maintenance Activities. Where does Planning fit Into Good Maintenance Practices. Design of work order systems, auditing work orders and training in completing work order preparation. Short discussion of the work flow with a job control function. Complete Planning questionnaire so that participants can evaluate their own current planning operation against competent and world class organizations. Complete description of the planner’s job. What are the conditions necessary for effective planning? This section includes a discussion of the institutional systems necessary for successful planning and scheduling. Specific areas include storerooms, PM programs, planner Libraries, supervision and high level sign-off. What are the steps in effective planning? The complete planning process. Workshop exercise in specific job planning. This is called micro-planning (job by job). What are the contents of a complete planned job package. The contents are based on the complexity, hazard, experience and size of the job. Calculating available hours from maintenance workers. Given your straight time year how many hours are actually available for maintenance scheduling. Includes work sheets. Complete scheduling and coordination questionnaire so that participants can evaluate their own current planning operation against competent and world class organizations. Scheduling Maintenance Work. Coordination with Operations and Coordination meeting. Includes a generic agenda for the weekly coordination meeting. One task at the coordination meeting is Job Loading until available hours are used up. We will perform a job loading exercise in this section. After the jobs are loaded the next step is to create a credible schedule that takes all the constraints into account. How to use CMMS to Aid Planning and Scheduling. Metrics and Benchmarking Planning and Scheduling includes both direct and indirect measures of maintenance effectiveness. Option 1: The most basic way is to just talk on the phone (or use E-mail) and then present a standard course. The courses are tried and tested and has been used to good effect in many maintenance situations. Option 2: The second and most common option involves a one day site visit before the class, which allows us to add examples from your facility and adjust the verbal presentation to more nearly suit your needs, meet some of the key players and see for myself some of the special problems you face. Option 3: The third option is to conduct a maintenance survey which looks at all of the aspects of maintenance, evaluates areas where improvements are possible and a slanting of the training to the competencies needed to implement the improvements uncovered in the survey. Email efss@fallsafety.com or Phone (800) 372-7775 Extension 130 to discuss your specific needs.